Today: A classic French tart gets updated for 2015 (and goes gluten-free). When strawberries are sweet, my mind goes to the classic French fruit tart: a perfectly tender shortbread crust with sweet ripe berries nestled in vanilla pastry cream. 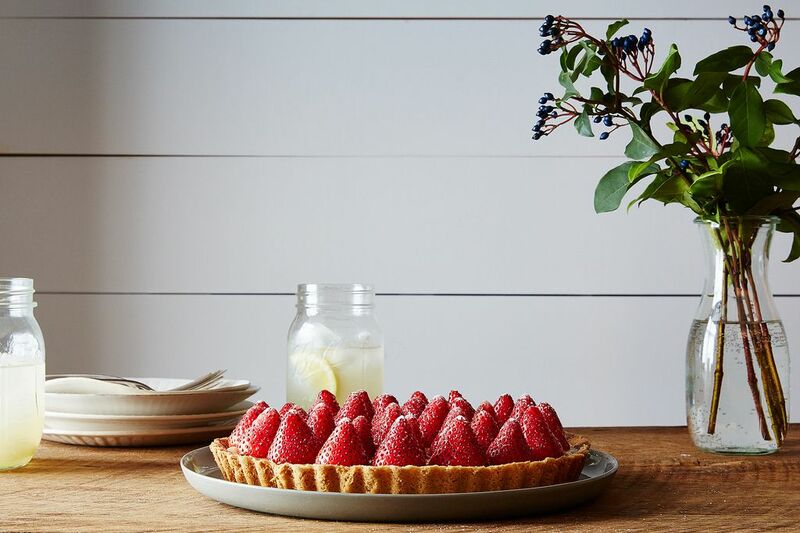 The strawberry tart, updated for 2015, has a crunchy buttery oat flour crust and a brand new and improved vanilla pastry cream made with rice flour. Oat flour makes an amazing crust—it’s as good as but different from wheat flour—with nutty toasted grain flavors and notes of caramel or toffee that partner perfectly with the berries and the pastry cream. Everyone will enjoy the tart on its own merits regardless of the fact that it happens to be gluten-free (if the oat flour is labeled gluten-free). The tart should be served on the day it is assembled, but you can make the pastry cream and the crust a day or two ahead: Keep the former covered in the fridge and latter wrapped airtight at room temperature. The dough may seem much softer than other tart doughs. Use the heel of your hand and then your fingers and/or a small offset spatula to spread the dough all over the bottom of the pan. Press it squarely into the corners using the sides of your index finger to prevent extra thickness at the bottom edges, and press it as evenly as possible up the sides of the pan, squaring off along the top edge. Have patience; there is just enough dough (although you may not think so at first). Here’s a trick for a perfectly even crust: Once you've pressed in the crust, lay a sheet of plastic wrap against the bottom and up the sides of the pan and lay a paper towel on top. Set a straight-sided, flat-bottomed cup on the towel; press and slide the cup all over the bottom and into the corners to smooth and even the surface. Leave the plastic wrap in place when you refrigerate the dough. If you want a little shine to the fruit, add it shortly before serving: Simmer 1/4 cup red currant jelly with 2 teaspoons sugar for a minute or two, until the mixture is thickened and sticky. Use a pastry brush to dab the fruit with just enough of the glaze to make it sparkle—don’t try to completely coat or cover the entire fruit and don’t try to use all of the glaze. Leftover glaze can be refrigerated for another tart, spread on toast, or added to your morning yogurt. Bigger is not better; smaller berries are often sweeter (and prettier). Wet fruit is one of the worst things that can ever happen to a fresh fruit tart! After rinsing the berries, spread them in a single layer on a dishtowel or paper towel. They should be completely dry before assembling the tart—if necessary, pat them with more towels, set them in front of a fan, or dry them with a hair dryer on the cool setting. Yes, I am that serious! Pick up a copy of Alice's new book Flavor Flours, which includes nearly 125 recipes -- from Double Oatmeal Cookies to Buckwheat Gingerbread -- made with wheat flour alternatives like rice flour, oat flour, corn flour, sorghum flour, and teff (not only because they're gluten-free, but for an extra dimension of flavor, too). This sounds really intriguing to try. I just bought your Flavor Flours book and can't wait to dig in, as I've recently found some unusual flours but hadn't yet figured out what to do with them! PS Kudos to your photographer, Leigh Beisch, too - the imagery looks so elegant and enticing. Thanks for the recipe Alice - I've been looking for something like this to make on special occasions for a while now. Great that there's no gelatin involved either!